I already said it in my guide to East Timor, I’m curious by nature. Since I was backpacking Southeast Asia, I told myself “Let’s go to less visited areas, especially since I’m here in Southeast Asia“. That’s how I decided to spend three days in the kingdom of Brunei, the tiny country located on Borneo. Borneo is an island shared by Indonesia and Malaysia, and Brunei is enclosed in the Malay part. Althouth the rainforest covers 75% of the territory of the country, almost half a million people live in Brunei. Brunei hosts approximately 250000 tourists per year, so you don’t run into tourists on every corner. In the title of this article, I talk about spending “three days in Brunei“, but I actually spent three days in Bandar Seri Begawan, its capital. What’s the first thing I noticed when I arrived in Brunei? The wealth of the country. Apart from Singapore, all the countries in the area are developing countries. This is clearly not the case here in Brunei. I have to tell you the sultan of Brunei, Hassanal Bolkiah, is one of the world’s richest person, mostly thanks to the huge oil and gas reserve of the country. He reigns over the country since 1967, and it is said that he has more than 5000 luxury cars. Here I am, walking around in the streets of Bandar Seri Begawan, and it jumps out at you, there’s a lot of money here. All the cars look brand new (like in Ashgabat, Turkmenistan), and the city is extremely clean. Before getting there, I met a few backpackers who had been in Brunei. They were telling me Bandar Seri Begawan is a boring city, with not much to do. I don’t agree but I understand their point of view : the kingdom of Brunei is a very conservative country. That means you won’t be able to buy a single drop of alcohol, they don’t sell cigarettes, and there’s no nightlife (no bars nor clubs). Forget about the wild parties of Vang Vieng! If you wanna drink, go to Miri, it’s two hours away by car. It’s a Malay city (just behind the border), and you’ll find plenty of bars and alcohol. Like all the conservative countries, it’s still possible to buy alcohol on the black market, but I wouldn’t take the risk… It’s a 300 dollars fine if you get caught, and you’ll face a death sentence if you’re selling or if you’re having drugs. Brunei introduced Sharia law into its penal code, which means they have recourse to flagellation in case of alcohol consumption, lapidation in case of adultery, and amputaion of a limb in case of theft (the Sharia law is valid for Muslim citizens of the country only). The streets get completely empty after 9pm. Actually, even daytime, the streets are quite empty. People don’t really get around by foot, but mostly by car or by bus. Sometimes I saw some people in the street, and upon spotting me, they greeted me with great smiles. Almost all the women I saw were wearing the veil. But generally, the city is quiet, there’s no bustle in the streets. You’ll see some stray dogs, even a few monkeys, but that’s it! Bandar Seri Begawan reminded me of Dubai, but it’s less bling-bling. The streets are quite empty in Bandar Seri Begawan! What to do in Bandar Seri Begawan? An unmissable is the Omar Ali Saiffudien mosque, made of marble and gold! 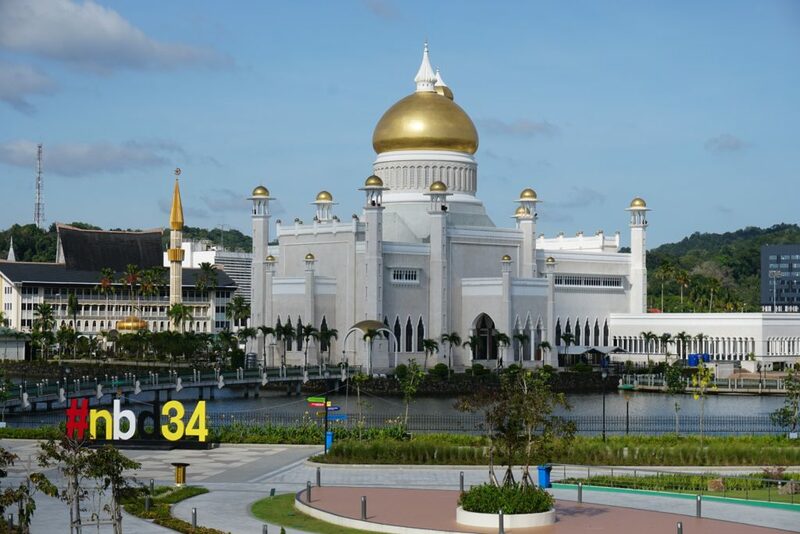 This is said to be one of the most beautiful mosques in Southeast Asia, and it’s named after the 28th sultan of Brunei (the current sultan is the 29th). The mosque was completed in 1958, it’s 52 meters (171 ft.) high, and supposedly it can be seen from anywhere in the city. It’s surrounded by a beautiful lake and a wonderful garden open in 2017, le Taman Mahkota Jubli Emas. I tried to get in several times, but they always refused to let me in. So I thought it was forbidden for the tourists to get inside, but apparently, some travelers managed to get in. Another one you have to see is Jame Asr Hassanil Bolkiah mosque. It’s a bit far from the city center, but the mosque is wonderful, and impressive. It was built in honor of the current sultan of Brunei, Hassanal Bolkiah, and it’s 58 meters (190 ft.) high. The mosque has 29 domes (cause the current sultan is the 29th), and also four minarets. It’s possible to visit some parts of the mosque for the non-Muslims at specific hours (from 9:30am to 11:30am, and from 2 to 3pm), but I arrived at 3:15pm… Bus #1 goes to the mosque from the city center. Take some time to see Kampong Ayer, also called “the Venice of the East”. It’s a water village, and you can get there by taking a water taxi (it’s $1 and it’s barely a two minutes ride). Almost 40000 people live there, it’s a real city in the city! There’s not much to do there, but it’s still nice to have a walk there. Otherwise, you can ask the boat drivers to take you for a tour on the water. It’s like 20 dollars. If you have some time, you can go to the Tasek Lama Park. You’ll see many families there, kids playing, and you can even hike in the park! I saw many locals exercising in this park, some of them were quite old! There’s also a waterfall in Tasek Lama park! I’m not much into museums, but you can visit the Royal Regalia museum. It’s free to get in but I didn’t go. You mostly learn about the history of Brunei, and some gifts given by various nationsn to the sultan are exhibited. There’s also the maritime museum, and the Brunei history center. Finally, I wanted to visit the Nurul Iman palace, which is the residence of the sultan. When I arrived, I found out the palace is closed all year long… except on July 15th, on the sultan’s birthday. That day only, they open the doors and you can visit his abode! There are other places to visit, but I didn’t go : Ulu Temburong National Park and the Gadong night market, where -from what I heard- the food is good and cheap! I only stayed for three days in Brunei, but I liked it. Bandar Seri Begawan is a quiet capital, and people are nice. I talked about it just below but there’s no safety problems, not even for the solo female travelers. You can go there with no fears. Wanna go to Brunei? Check the visa policy here. Most Western countries can go there visa-free. Be careful, they ask for an onward ticket, and even the hotel reservation sometimes! Don’t go to Brunei without a travel insurance! I paid 20 dollars the taxi ride from the airport to the hostel in the city center. I stayed at City Backpackers. Great location, and the manager is really nice. The currency is the Bruneian dollar, and is pegged to the Singapore dollar. In Brunei, both currencies are accepted! Apparently, even in Singapore both currencies are accepted, but I can’t confirm! Brunei is a safe country, there’s no safety problems! Ladies, just one thing, avoid wearing plunging necklines and mini skirts, and you’ll be fine! The best way to get around : by foot or by bus. Avoid taxis, they’re sooo expensive (there are very few taxis because everybody owns a car). The best time to go there? From February to April! It’s not too hot, and you avoid the rain! I think you need at least 40 dollars per day to stay there. Fortunately, the food is not too expensive, I had a great dish in the market and I just paid two dollars! Talking about food, they mostly eat Indian or Chinese food. There are also Western restaurants. Be careful, don’t drink tap water. I find that whether or not you can rely on people’s advice about a place, depends a lot on whether you travel for the same reasons they are. I’ve not yet been to Brunei even after all this while, this is quite helpful. Yeah right, I completely agree. I tend to read and listen different points of view before going somewhere. And I still go to places when people tell me beforehand “Don’t go, it’s boring”. I like to make my own opinion of a city/country. This was incredibly informative and I loved your photos! I would love to visit Brunei one day, it sounds fascinating! Awesome!! That looks so dreamy, Unreal ! I am packing my suitcase for Sicily and I’m really hoping to get some gems of experiences and photos as good as yours. Incredible Brunei! Awesome post… I appreciate your time and effort in your work. Keep posting..
Glad you like my posts! Thank you!